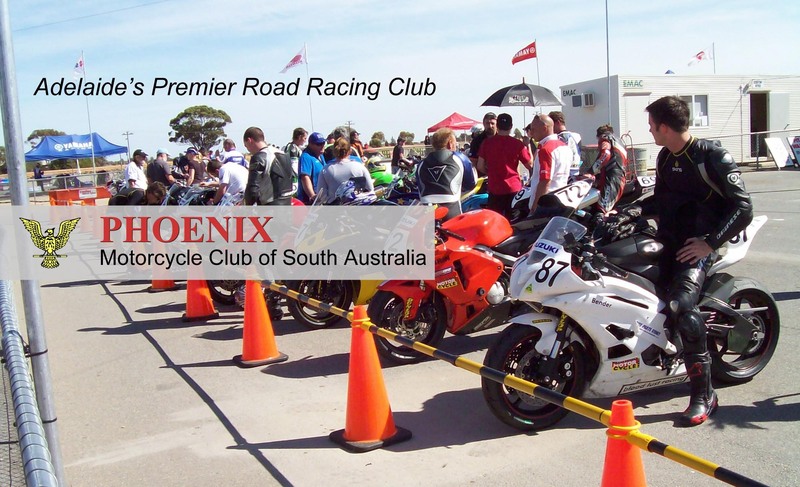 Public ride days are run at Mallala Motor Sport Park. To book your place at any MMSP Ride Day this year, go to the Events page at www.mallala.com and find the link for that day. You can also pay for your pit garage or Track Licence if you need them. Note: The site accepts Card payments only and bookings closes on the Wednesday prior to each event. If you have not booked, you can just turn up and pay at the track. Fill in this form when you get there, or print it and take it with you. However, there are only 35 places available in each group so you might miss out. For further information, contact MMSP on 8276 7744 (office hours). Members of the Cafe Racer and Phoenix clubs assist MMSP with the running of these days. If you have any problems at the track, or just want some advice, talk to one of the officials. Please remember that this is not a race day and the people around you may be inexperienced, so ride safely. Go to the office and pickup your paperwork. When you have signed in you will receive a coloured wrist band for your Group. This must be displayed at the pit gate to enter the track. Take your Bike and Equipment to the Scrutineer Bay for your safety check. Take your bike back to the pits and do some final checks. Just basics like fuel, tyre pressures, go over your riding gear …and don’t forget to clean your visor. Go to the Rider Briefing …and LISTEN! Ask questions if you’re not sure. Listen for the Pit Announcer to call up your Colour Group. Please feel free to invite your friends and family to come and watch your experience, there is no admission charge. Snacks and drinks can be purchased at the canteen. Groups are based on speed and experience and run in rotating 15 minute sessions. The groups are flexible, so if you get quicker through the day, or if you get tired and slow down, you can move up or down a group. See a Track Official if you want to change. It is very important that you are in the correct group for your own safety and those around you. If you are found to be in the wrong group or riding in a dangerous manner, we will take appropriate action. NOTE: you are sharing the track with riders of lesser experience who may do something unexpected. Be aware of other riders around you. For rider safety, the number of riders in each Group is limited. Before you get out on the track it is important to have your bike and gear ready to go, otherwise it can ruin your day before it even begins. A few simple tools and checks can not only make your day safer but much more enjoyable. Of course your bike will be checked by a machine examiner at the start of the day but its no good getting there and then being sent back to the pits to fix something. Check the operation of your brakes, suspension and levers. Check there are no obvious fluid leaks. Check there are no loose panels, bolts or clips. Check the chain for correct tension. Long hair must be secured. Use a Hair Net, Balaclava or Beanie to keep it tucked in. A back protector is recommended to prevent spinal injury. Avgas, E85 and 98 are now available at the track. A Credit Card is required to operate the bowser. Riding on the track puts a much bigger demand on your tyres so it is important to have good tyres and have them correctly inflated. This might sound low but there are a few reasons for this. OEM pressure is at the upper limit to allow for things like passengers or loads. Lowering the pressure will get the tyres to operating temperature quicker. A lower pressure means more flex and a bigger footprint on the track. A bigger footprint means more grip. Remember you can always adjust this to suit your riding.